The Polestar 1 is arguably one of the best looking modern cars out there. It's also the first and last hybrid from the electric-performance subsidiary of Volvo. Today at an event in Sweden the automaker unveiled its second car and first pure EV, the Polestar 2. 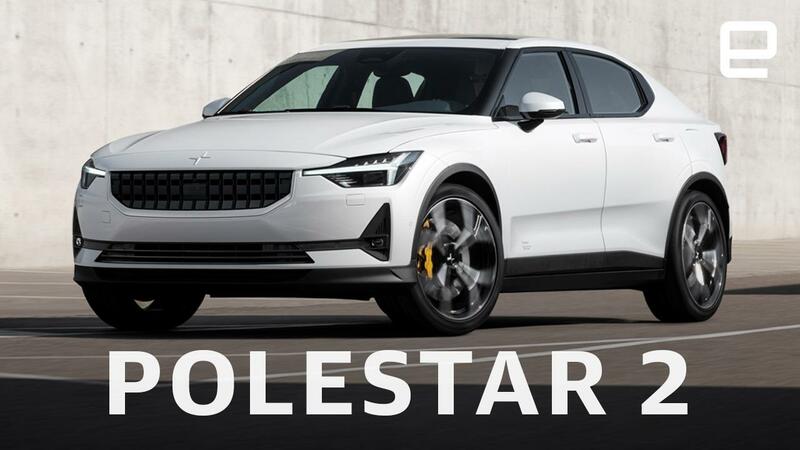 With an expected range of 275 miles (the EPA will have their final say when the car is available for testing), 408 horsepower, 487 foot-pounds of torque and a zero to 60 time of under five seconds (via two electric motors), Polestar clearly has the Model 3 in its sights. All that power comes from a 78kWh battery pack nestled under the floorboards. Polestar says the battery pack adds additional rigidity to the chassis. "It fits like a Lego brick," said Polestar Thomas Ingenlath, CEO of Polestar. But the automaker notes that it also reduces road noise by 3.7dB. Couple that with the electric powertrain and the inside of the Polestar 2 should be a pretty quiet affair. Maybe they don't want the noise to distract you from the fact that this is the first car with Google's embedded Android platform. The system will use native Google services like Google Maps which will have support for electric vehicle ownership with the same voice-control you've come to expect from Google. In other words, you'll be able to find charging stations via navigation on the vertically-mounted 11-inch display. iPhone users shouldn't fret, the system will work with Android and iOS. That display will also have enlarged graphics so when a driver approaches the vehicle, they can quickly see the charge and range status of the Polestar 2 at that moment. That feature works in conjunction with a phone-as-key Bluetooth-enabled function that allows the car to be shared easily with friends and family via an app. To start the car, you just sit down in the vegan driver's seat. The button is actually integrated into the chair. There's no key to turn or button to push. Unfortunately, it's going to be a while before we get a chance to take the new Polestar for a spin. Production is set to begin in 2020 and the first vehicles won't be cheap. Initially only an all-wheel-drive "launch edition" will be available for the first year starting at $63,000 (and initially for the United States, only available in California). But if you can swing the cash and want one of the first cars EVs from the company, you can pre-order one now. Polestar will only sell the cars online. But, will have stores called "Polestar Spaces" where interested folks will be able to check the car out and take it for a spin. It'll be sort of like a car dealership and an Apple store had a baby that sells cars. If you like what you see, you can order it. While the initial offering will be pricey, the automaker has talked about a $40,000 starting price tag for the Polestar 2. Right now the automaker is saying that its guide price is €39,900 (Approximately $45,000). Plus, there will be the option to subscribe to the vehicle via Care by Volvo which essentially means drivers will only have to pay for the electricity needed to propel the vehicle. Considering how quickly the Polestar 1 pre-orders sold out (only 200 were allocated to the United States), you might want to be quick with that pre-order button.